Morphological studies date back here. At this time the ancient linguist Panini (see History of Linguistics) formulated 3,959 rules of Sanskrit morphology. Greco-Roman grammatical tradition interest in morphological analysis an studies in Arabic morphology by Marāḥ al-arwāḥ and Aḥmad b. ‘alī Mas‘ūd. Prague School: earliest group of linguists who set up their own literary circle. Used functioning frameworks and theories. Influential to Michael Halliday when developing his own ideas on systemic functional grammar. Copenhagen School has changed approach from structural to functional (see table below). Digital South Asia Library [online] Available at: http://dsal.uchicago.edu/reference/gazetteer/pager.html?objectid=DS405.1.I34_V02_298.gif [Accessed 15.05.2013]. Prague Linguistics [online] Available at: http://www.praguelinguistics.org/en/about [Accessed 15.05.2013]. Seuren, Pieter A. M., (1998). Western linguistics: a historical introduction. London: Blackwell. University of Essex (2012) Lexical Functional Grammar [online] Available at: http://www.essex.ac.uk/linguistics/external/LFG/ [Accessed: 15.05/2013]. 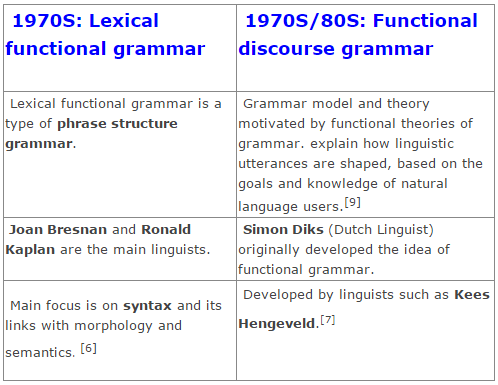 Functional Discourse Grammar website (2009) [online] Available at: http://home.hum.uva.nl/fdg/Home_index.asp [Accessed: [15.05.2013]. hRole and Reference Grammar [online] available at: http://wings.buffalo.edu/linguistics//people/faculty/vanvalin/rrg.html [Accessed 15.05.2013]. Wikipedia – Functional Discourse Grammar Page [online] Available at: http://en.wikipedia.org/wiki/Functional_discourse_grammar#cite_note-0[Accessed 18.05.2013].